Is there anything that takes my fancy more than sprouts in spring? No, there isn’t, or maybe, but I cannot figure it out now. I am so excited about the first sprouting year after year. It brings such joy and delight to see life expressing itself so vitally. The transformation that goes on in these tiny pulses is extraordinary. Firstly, from hard to chew they suddenly turn nice and soft. They also become very easy to digest, even if eaten uncooked. And the last thing, which is just amazing, is that they turn from acidic to alkaline. Pulses, in their dry form are an excellent item for winter season. We need more sustenance when it is cold, but when the spring comes, we need to detox. Nature provides us exactly what we need in many forms of spring food items and the one that stands out is sprouts. Alkaline food scrapes mucous from the gut and enhances digestive activity. The taste of sprouts is astringent, which is exactly what you need to balance the sweet, sour and salty tastes you’ve had plenty in winter. Also pungent and bitter are in vogue now and these tastes you can easily find in your kitchen spice cupboard. All sorts of leafy greens also provide these flavours and enhance the digestibility of the bulk of your food. I am very inspired to share with you a recipe that is by all ayurvedic parameters a proper plate of seasonal food. The sprouts I’ve used can be changed, any pulses that take your fancy really. 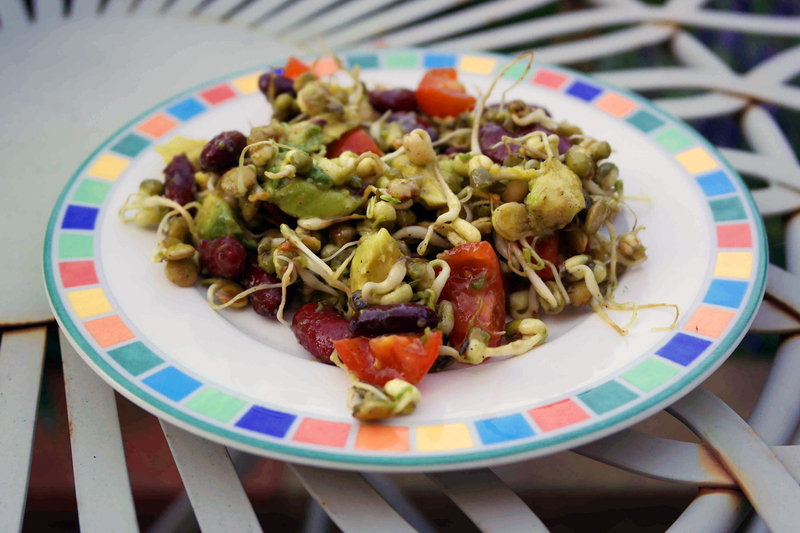 I love mung beans because they are fleshy and succulent but also chick pea sprouts are great. Start by heating ghee in a pan with garlic, a pinch of asafetida and some cracked black pepper. Add the beans and toss around for a few seconds only. In a separate bowl mix the sprouts and avocado cut in pieces. If you like raw onion or leek you can add a small amount to give a bit of tanginess. Mix spiced beans in, add olive oil to taste and season. P.s. If you are worried about the amount of fats in this dish, no reason to. These are all healthy forms of fat and will be used for metabolic functions.